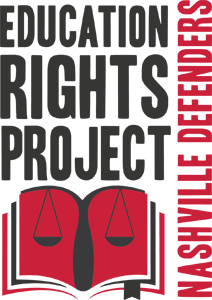 Nashville Defenders’ Education Rights Project provides advocacy and legal representation to Nashville’s students with disabilities to help them succeed in school and stay out of the juvenile justice system. Research indicates that 60 – 70% of children involved in the juvenile justice system have a disability or mental health diagnosis (National Center for Mental Health and Juvenile Justice, 2006). For this group of students especially, we work to make a difference. Students who receive our services attend school more regularly, get better grades, have fewer suspension days, and are referred to court less often than prior to involvement with our program. We are often able to use the results of our education advocacy to get better outcomes for children involved in juvenile court cases.